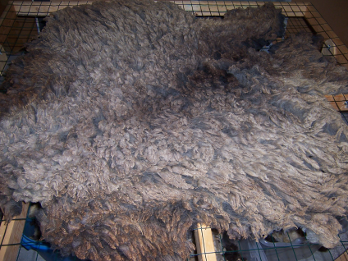 We sell raw wool fleeces from our naturally colored and white Corriedale sheep. 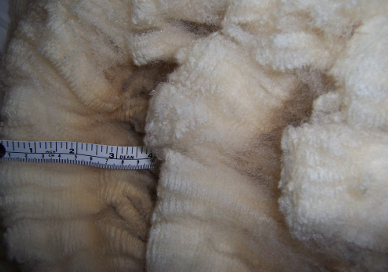 Our fleeces can be divided into two groups: first, wool with exceptionally fine fiber diameter and a tight crimp pattern, unusual for the Corriedale breed, and second, what we call “classic” fleeces, those with a broader crimp very typical of a Corriedale sheep. We select our sheep for wool with exceptionally soft handle, in almost all cases suitable for next-to-the-skin wear. The raw fleeces we sell are nearly VM-free, because we include only the cleanest wool from under the sheep’s jacket, and heavily skirt the fleece so that all the wool unsuitable for spinning is removed. That way you can enjoy transforming the wool into wearable and displayable art, instead of wasting your time picking out “stuff.” We are proud of our wool quality, and would never sell a fleece that we would not be willing to use ourselves. Your fleece will arrive in one piece as it was shorn from the sheep. 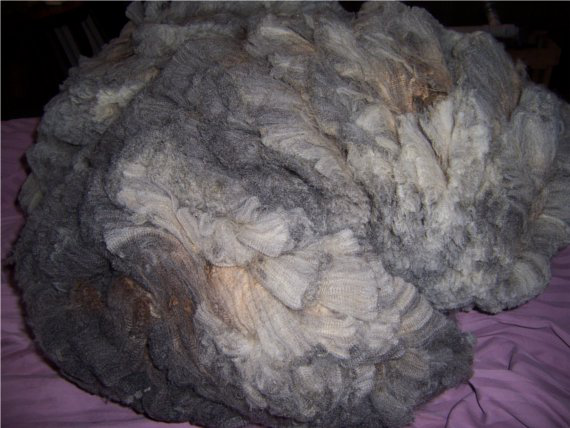 As with all raw fleeces, there will be a few second cuts in the fleece, but we do our best to remove all that can be found so you will only pay for fiber that you can spin. 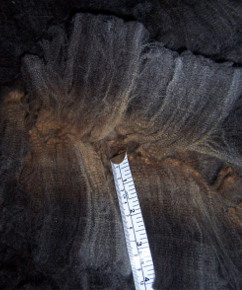 Every fleece passes checks for soundness and tenderness. We do our best to make sure that none of the wool from our sheep is wasted. The skirted wool from our raw fleeces is processed into both roving and, when enough wool is available, into millspun yarn. We are fortunate to live only a half hour’s drive away from one of the best mills in North America for processing fine wools, Blackberry Ridge Woolen Mill. Anne and her assistants professionally wash the skirtings, card them with large traditional carding machines, and produce beautiful ready-to-spin roving with nearly all the VM removed. We think you will love the experience of our soft, plush fleeces in all colors of the natural wool rainbow, or springy ready-to-spin roving. Please browse our Etsy shop for our raw fleeces; our own online shop will open soon with additional fleeces and roving ready for you to enjoy.